The company is known for their successful Kickstarter and release of the KAT Walk. 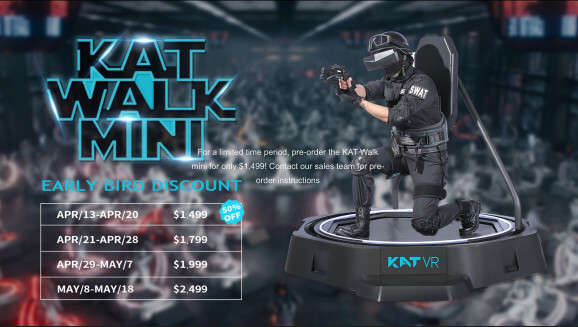 China-based company KAT VR has announced a new product in the form of the KAT Walk Mini, a smaller omni-directional treadmill designed for use with virtual reality (VR) titles. One week after telling fans that its latest, smallest model would be affordable for “the average consumer”, the company published pre-order prices on the Kat VR website, with the lowest early bird discount of 50%, the minimum price is $1499 ahead of a regular price of $2,999. The Kickstarter campaign for the KAT Walk was successful in raising over $150,000 (USD) back in 2015 and now the company aims to do the same again with the KAT Walk Mini. Preorders for the accessory open today, April 13. Interested customers are now urged to contact the company’s sales team for pre-order instructions.